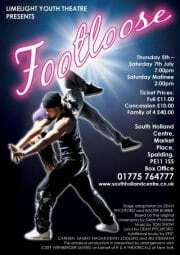 Home > Blog > Mama says…go and see Footloose! Mama says…go and see Footloose! A talented group, aged 11 to 17 years, took to the stage last night and wowed the audience with a performance full of energy, slick dancing and faultless singing. I remember the movie, on which the stage production is based, back in 1984, with Kevin Bacon and Lori Singer in the lead roles. I even saw the professional West End production of the musical in 2006. So, no pressure guys! But I have such admiration for the Limelight kids: I’ve watched them for many years now and even helped to judge their talent show last year. I knew they wouldn’t disappoint: they learn all aspects of their art from an early age and their director, Darren Maddison, would be working them hard. Footloose tells the story of Ren McCormack who moves from Chicago to middle-of-nowhere Bomont with his mother, Ethel, after his father leaves them. Ren struggles with the petty laws of the town, particularly the one banning dancing, and seeks to change the outlook of the small-minded Town Council and local preacher, Reverend Shaw Moore. The singing throughout this production, from the strong leads Ren and Ariel (Jordan Howlett and Gabby Huggins), down to each member of the ensemble, was excellent, even more so when you consider many of the numbers involve a huge amount of dancing at the same time: it takes stamina and good breath control to make this work without running out of puff. The big dance numbers, Holding out for a Hero, Hoedown Throw Down and Let’s Hear it for the Boy, were brilliant to watch and listen to: the audience were treated to huge smiles, tight choreography and harmonious, powerful voices. Limelight performers also know how to work the ballads too. Learning to be Silent, sung by Amy Mann, Abbie Shrimpton and Gabby Huggins was beautiful and pitch perfect. A special mention for Amy Mann, playing Ariel’s mother, Vi Moore, whose exceptional plaintive voice, with just a touch of feather-light vibrato, made the song Can you find it in your Heart, one of the highlights for me. There were some great comic moments too. Beth Mason and Kieran Watson were well paired as Rusty and Willard: I loved them. And Chuck’s sidekicks Lyle and Travis (Josh Newton and Alistair Hastings) prove you can shine even in minor roles. The bad boy character, Chuck, was played with just the right amount of menace by Niall Dignall: great casting, there. But Footloose is all about the dancing so everyone in the group numbers needs to be congratulated for their levels of energy which made this show such a success. Coupled with great visual projection wizardry and a simple but effective set, the production was top notch. Mama says…. put on your leg-warmers and ra-ra skirt, and get along to the South Holland Centre tonight, Friday 6 July (7pm) or tomorrow Saturday 8 July (2pm and 7pm). These young kids will lift your spirits and your heart. So you're feeling as old as me, Steve? It was really good, I was very impressed. Great 80s songs and it felt like only yesterday for me: ancient history for these young performers! greeeeeeeat now I have an ear worm "everybody cut, everybody cut, everybody cut cut FOOTLOOSE DOoooDOoooDOoooDO"
I've been squawking it since Thursday. Even heard 'Holding out for a Hero' on Radio Two on Friday morning. Thought I was still dreaming. Ah, Kevin Bacon!! !Lots of acne back in them days though….he's much improved with age!When exactly does history become ancient, Trish? Right now I'm feeling positively medieval!Have a great (dry?)weekend. I shall have to google his 1980s face and have a look! Now that's a question: when is history ancient? No idea; it's all Greek to me.